AIM: To lead students to discover two things Jesus did to identify Himself as the Messiah, and to examine themselves to decide if their behavior gives evidence that they are truly Christians. Before class: Read the notes on John 2:1-25 found in the Sunday School Teacher Book. INTRODUCTION (Create Learning Readiness): Tell the students that in a short time we will all leave Sunday School class and go to the Worship Center to take part in our morning worship service. Ask them to name some of the things that usually take place in the worship service (announcements, welcome, singing, prayer, special music, preaching, and the invitation). Comment that we can be pretty sure those same things will happen whenever we gather for worship. That’s what we expect, so we are not surprised when they take place. Ask the class to imagine that this morning during preaching you get up from your seat, storm up onto the platform, tell the pastor to stop preaching, turn over the pulpit, throw things off the platform, and run the choir and orchestra out of their seats. After clearing the platform and choir you then tell the church they need to pray. Ask: “What would you think if I did those things in church this morning?” (they might think you had gone crazy or had taken medication that affected your thinking). Ask: “What might happen to me if I did those things?” (the ushers would probably restrain you, take you out of the Worship Center, and perhaps call 911 to have you taken away for mental evaluation). Tell the class that would be a very strange occurrence. Tell them in today’s lesson we will discover a similar strange occurrence. Remind the students that we are in a six-month study of the Gospel of John. Ask: “Do you remember why John wrote this account of Jesus’ life?” (so his readers would believe that Jesus Christ is the Son of God and have everlasting life by trusting in Him – John 20:31). Ask: “What was last week’s lesson about?” (several ways Jesus was identified: Lamb of God, Son of God, Messiah, the one prophesied by Moses and the prophets, King of Israel, and Son of man). Ask if any volunteer would be willing to recite last week’s memory verse (John 1:29). A Miracle and Its Result. Remind the students that John the Baptist baptized Jesus in the Jordan River near Bethabara (John 1:28). Afterward, Jesus and His disciples went to His home territory of Galilee (John 1:43). Jesus, His mother (Mary), and His disciples were invited to a wedding in the town of Cana, eight miles north of His hometown of Nazareth. Ask a volunteer to read John 2:3-4. Ancient wedding celebrations often lasted a full week, so a great deal of food and drink was needed to feed the guests. Wine was the common drink at meals because water purification was not available. Drinking water often made people sick, so they customarily mixed a little wine with their water. The alcohol in the wine killed germs and bacteria, but didn’t cause drunkenness unless taken in very large quantities. Ask: “What did Mary tell the servants?” (do whatever Jesus says). Explain that the six large pots used for Jewish purification rituals each contained 18-27 gallons of water. Ask a volunteer to read John 2:7-10. Ask: “What did Jesus tell the servants to do?” (fill the pots with water and then draw out some and take it to the governor of the feast – the person responsible for hosting the feast and providing the refreshments). Ask: “What had Jesus done to the water?” (miraculously turned it into wine). Tell the class this is the first miracle recorded in the Gospel of John. Remind them that each miracle and each event described in John’s gospel was specifically chosen to help readers understand that Jesus is the Son of God so they can be saved. Ask: “According to verse 11, what was the result of this miracle?” (Jesus’ disciples believed on Him – they believed He is the Son of God). Summarize: Jesus performed a miracle at the wedding at Cana not just so the guests would have enough to drink, but primarily to strengthen the faith of His disciples. A Ruckus and Its Result. Jesus, His mother, and His disciples left the wedding and went to Capernaum, about 17 miles northeast of Cana (locate Capernaum on the map). 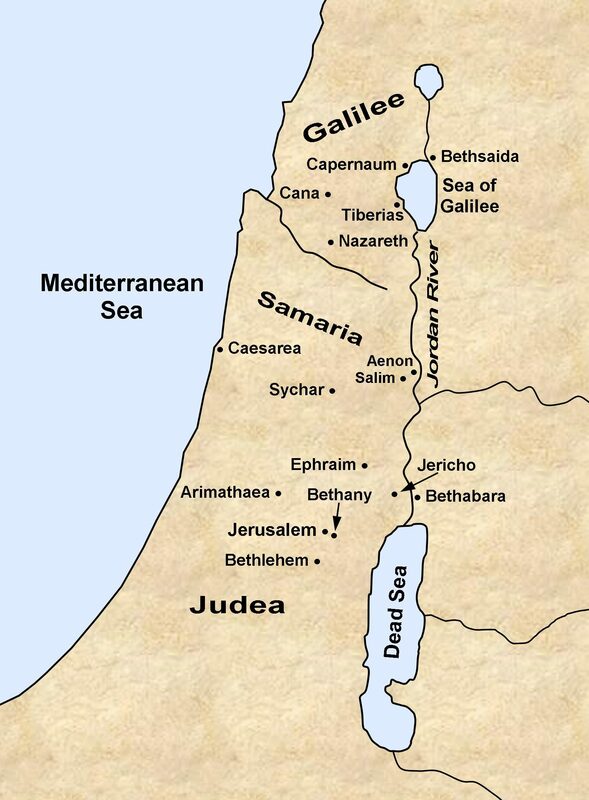 Jesus then went to Jerusalem for the Passover (locate Jerusalem on the map). Passover was the holiest religious event on the Jewish calendar. Jews from all over the world came to Jerusalem to worship. Ask: “What did Jesus find when He went to the Temple?” (people who sold animals and moneychangers). The Jews were required to bring sacrificial animals to the Temple in order to worship. Those who traveled a long way couldn’t bring their own animals, so merchants set up booths and sold animals. The Jews were also required to pay an annual Temple tax with a certain type of Jewish coin, so moneychangers made a business of selling the coins to those who had come from far away. Over time, the merchants and moneychangers corrupted the practice by selling inferior animals for inflated prices and overcharging for exchanging the coins. Ask a volunteer to read John 2:15-17. Ask: “What did Jesus do?” (He drove the merchants and their animals out of the Temple and poured out the moneychangers’ money and turned over their tables). Ask: “What did He say?” (don’t make my Father’s house into a place of selling). Remind the students of the opening story about you causing a disturbance in church. Ask: “How do you think people reacted to Jesus’ actions?” (they were probably shocked and puzzled). Ask: “What did the disciples remember?” (Psalm 69, a messianic Psalm, which says in verse 9 that the Messiah would have great zeal for the purity of His Father’s house). This strengthened their faith that Jesus was the Messiah. Tell the students the Jews who witnessed Jesus’ actions realized this was a sign to show that He was the Messiah. Ask a volunteer to read John 2:18-22. Ask: “What did the Jews ask Jesus?” (to show them a sign to prove He was actually the Messiah). Ask: “What sign did He give them?” (destroy “this temple” and in three days He would raise it up again). The Jews thought Jesus was speaking of the physical Temple buildings and courtyards, which Herod the Great began renovating and enlarging 46 years earlier, and which were still not completed. John tells us Jesus was actually speaking of His body, which would rise again after being dead three days. Ask: “What does verse 22 say about the disciples?” (after Jesus’ resurrection they remembered this promise; this strengthened their faith in the scriptures and Jesus’ words). Summarize: Jesus created a ruckus (commotion, disturbance) in the Temple not just to purify the Temple, but to announce His identity and strengthen the faith of His disciples. Ask: “While Jesus was at the Passover, what caused many people to believe in Him?” (they saw the miracles He performed; remember, John’s gospel only records seven miracles which helped identify Jesus as the Son of God, but Jesus performed many other miracles – see John 20:30 and 21:25). Ask: “According to verses 24-25, what does Jesus know?” (He knows everything about us, including what we think and whether our faith in Him is genuine). Summarize: Jesus knows everything about us, including our thoughts and true beliefs. PERSONAL APPLICATION: Ask: “What two things did Jesus do in this chapter to identify Himself?” (turned water into wine at the wedding in Cana and purified the Temple by throwing out the merchants and moneychangers). Tell the class that as different as those two events were, they both accomplished the same purpose: to show the disciples that Jesus Christ was God in human flesh, the promised Messiah. In addition to those two signs, Jesus also promised to rise again, which strengthened the faith of His disciples after the resurrection. Many other people believed in Jesus because of the miracles they witnessed. Tell the students the events described in John 2 identified Jesus as the Son of God. If Jesus were asked to show His identification He could point to the things recorded in John 2. In other words, Jesus’ behavior and actions showed who He was. Ask everyone to bow their head and close their eyes. Ask: “Does your behavior give evidence that you are a Christian?” Tell the students that Jesus knows their hearts. They may be able to fool others into thinking they are Christians, but Jesus knows the truth. Urge any who have never truly been saved to confess their sins and place their trust in Jesus Christ right now. Voice a closing prayer. CONCLUSION: Ask everyone to memorize John 3:16-17. Tell them next week’s lesson is from John 3, which includes one of the most well known verses in the New Testament. Next Sunday would be an ideal time to invite a lost friend to come to Sunday School.